This has to be one of my favorite nursery rhymes. I remember having this great nursery rhyme book as a child and the pictures from this one just stand out. When it came time to start teaching my preschool students poetry, by way of nursery rhymes, this was the first one I went to. 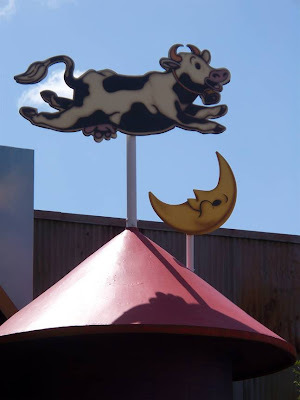 So, imagine my delight when I looked up outside of Al’s Toy Barn, where I was checking out Woody, Buzz, and the Green Army Man, only to see the cow making his famous jump. It brings home the point that Walt Disney World really is for the child in all of us.